TUCSON, AZ (KOLD News 13) - Congratulations to two amazing Tucson Unified Teachers who were finalists and the winners of the Arizona Athletics/UA Online High School Southern Arizona Teacher of the Year. University High School economics teacher, Jim Lerch, was named Teacher of the Year. Mr. Lerch challenges his students to think critically and have an interest in the world around them using economic principles. This is the 2nd award this year recognizing Mr. Lerch’s contributions to education. 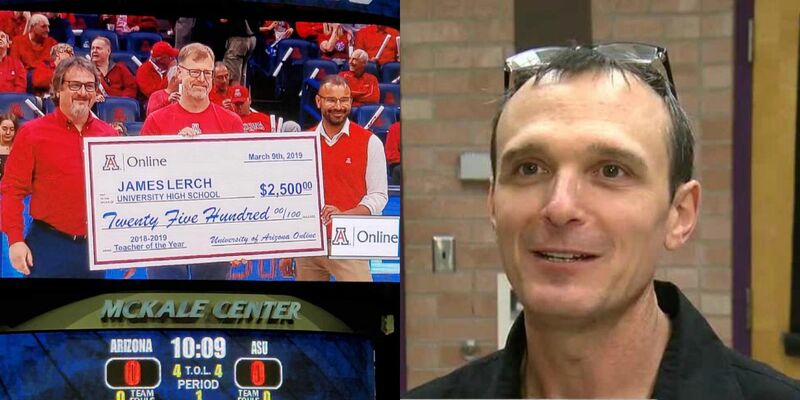 In November, Lerch was named the Arizona Council on Economic Education’s 2018 Economics Education Teacher of the Year, and now he has been selected to receive this award presented by Arizona Athletics and Arizona Online. Arizona Online is in the top 10 percent of online bachelor programs in the country. Kris Kissel of Sabino High School Drama Teacher was also one of the nine finalists of this award. Mr. Kissel has taught for 22 years and continues to inspire his students by creating a positive and creative environment where the students can gain confidence in being themselves.